The BCFDC is well known for its trains and trucks, but it also has a great deal of wildlife on site. The Canada Darner is a dragonfly species that many of you will be familiar with appearance wise. It has a brilliant blue colouring and the most amazing eyes you have ever seen! This one was spotted yesterday resting in the hot sun on the road past the Logging Camp, heading towards the Ranger Station. 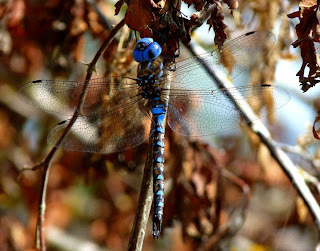 "A Canada Darner (male) showing the hunting equipment of a darner--powerful thorax and wings (for fast and agile flight); large compound eyes (for tracking moving prey); and spiny legs (for capturing prey in flight). The colour and shape of the lateral thoracic stripes are important clues for species identification. "Darners probably got their name from the old superstition that they sew up the lips of naughty boys with their long slender abdomens -- the devil's darning needles. The origin of the name Aeshna, coined by the famous Danish entomologist Fabricius in the 18th century, is also lost in history. One intriguing explanation is that it's a printer's error for the Greek Aechma, a spear" (Cannings & Stuart 1977). They are brilliant creatures and if you want a good place to spot one on your own, come and check out the Somenos Marsh trail one morning. Don't forget about our photo contest too! If you get an awesome photo on site, pick up an entry form in admissions. We want to see what you have seen on our amazingly multi-faceted site!